We can all agree that larger vSphere environments bring many challenges. One of them is updating all of the VMware Tools on the numerous VM guests. One of the solutions our team decided to use was to enable the VMware Tools Update during power cycling, previously discussed here. This worked for us well in vSphere 4.x and updated the majority of Tools in our environment. VMware has changed this feature in vSphere 5 however. Our environments were recently upgraded to vSphere 5 and everything was looking great! Then we had our routine maintenance weekend. This would update well over half of the tools and we would get the rest on the next maintenance weekend. That was the plan. We got VMware on the phone to investigate. They had no reports of this happening anywhere. After a long discussion, we were informed the order that the VMware Tools upgrade during power cycling was changed in vSphere 5. Instead of updating the tools on the way down, it now updates the tools after the server has already rebooted. I don’t know why this was changed but this now requires an additional reboot on top of the reboot that initiated the tools install. VMware did some further troubleshooting and had us perform further testing. When we encountered these dialog boxes in a Windows 2003 x86 server within the vSphere Console, the server did not reboot. 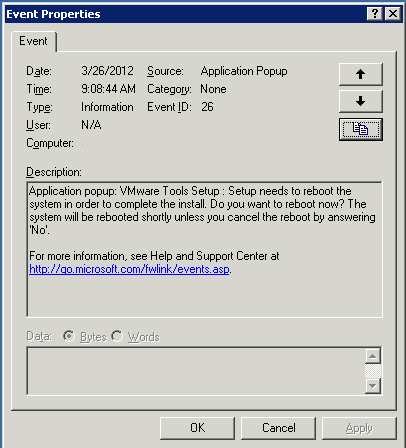 It did reboot when a user had logged in using a remote desktop client. VMware still has not given us a definitive answer as to why this is occurring as this is the first they have seen of it. I will post an update here when we get a verdict. Also, ensure the new order of Tools upgrade during power cycle will fit your needs. VMware never confirmed our testing that was described above. However, we are sticking to our findings and give caution to your updates.